Steel production was once a leading sign of industrial competence for developing economies. China bought into that story, but now the country’s huge steel industry is a drag. Olympic gold is another sign of greatness. In that domain, China still has a long way to go. China's first placed athletes bite their gold medals after the men's gymnastics team final in the North Greenwich Arena during the London 2012 Olympic Games July 30, 2012. 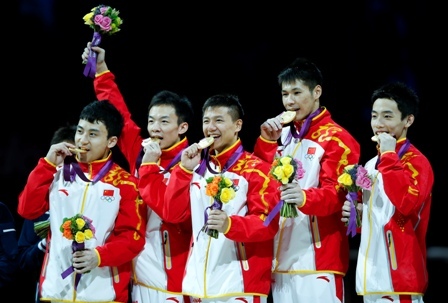 By July 31 China had won a total of 17 medals at the London 2012 games, including nine gold medals. China has won a total of 419 medals in the previous fifteen Olympic Games, according to the Chinese Olympic committee’s website. The country first participated in the Olympics in 1980. Chinese Olympians’ top events for gold medals are diving, gymnastics, and weightlifting. Profits at China’s steel mills fell by 96 pct in H1 2012 compared with the year before, according to figures released by China Iron and Steel Association on July 31. In 2011, China produced 46 percent of the world’s steel, far more than its share of global GDP, according to Reuters.